Azriel explains how he researches audiences and creates ad sets. You’ll discover which metrics to consider when testing Facebook ad performance. 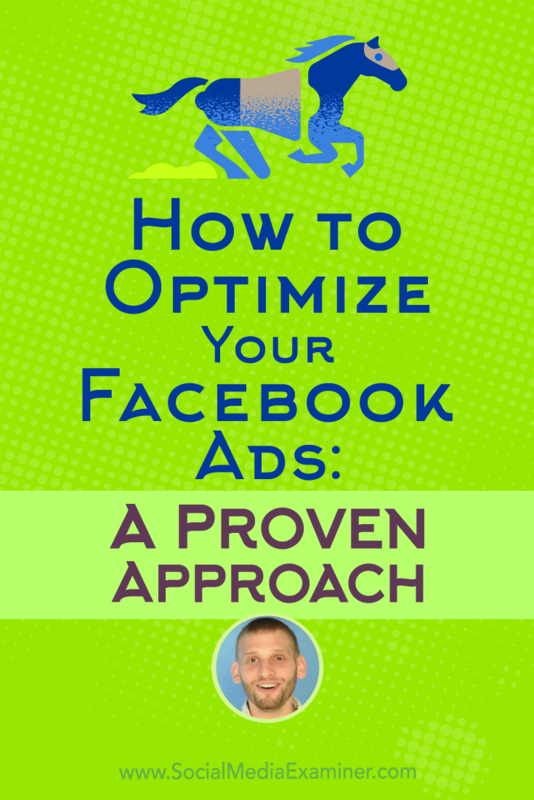 How to Optimize Your Facebook Ads: A Proven Approach featuring insights from Azriel Ratz on the Social Media Marketing podcast. About five years ago, Azriel started working for a friend whose business had an email list of 1,000 subscribers at the time. Azriel’s job was to post on Facebook, Pinterest, Instagram, and Twitter and figure out what posts worked or didn’t work. When Azriel looked at the analytics and noticed that certain Facebook posts worked really well, his friend suggested scheduling posts at certain times and targeting the posts based on what was already working. For instance, they created yes-or-no poll questions on Facebook, which attracted a lot of reach and activity. The polls asked how people felt about the day’s news. They also posted these questions on the website: A basic form asked a poll question and a reader had to give their email address to respond. With this approach, the email list grew to the tens of thousands, all without spending money on ads. Azriel’s friend wanted to know what would happen if they started putting money behind these posts, so they started running serious tests on Facebook. Over the next three years, the list grew to about 150,000 email addresses and led to ecommerce sales and client work. Two years ago, Azriel started his own business, focusing solely on optimizing Facebook ads for clients. Ratz Pack Media focuses solely on optimizing Facebook ads for their clients. He discovers what audience and content work best and then uses Facebook ads to target each client’s best potential audience with the best potential ads. As a result, clients get the best return on their ad spend. Listen to the show to discover what Azriel studied in college. 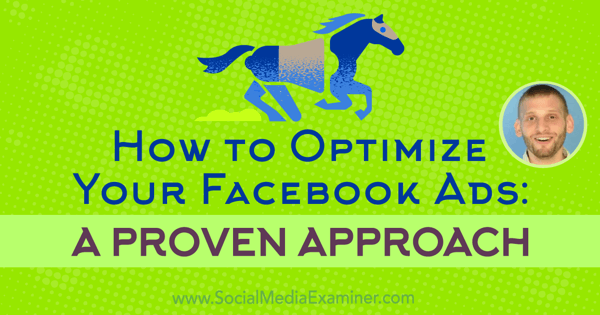 Most people think that creating Facebook ads is a very basic process. They know who they want to talk to and what they want to say. Based on that knowledge, they create an ad, choose an audience (thinking Facebook will figure it out), and let the ad run. They believe the cost is what it is, and they can’t do anything about it. However, Azriel explains, if a business talks to the same person a different way by creating slightly different ads, this change could possibly save the business money on the cost to reach that person. Over time, a savings of even one cent per click could potentially save a company hundreds of thousands of dollars, depending on the ad spend. Listen to the show to hear my thoughts on conversion rate optimization. Azriel’s process reflects the structure for creating ads in Ads Manager. However, before you begin creating ads in Ads Manager, you can use the specifics of Azriel’s process to begin thinking about how to build your ads. Identify what business goal you want to achieve by running these ads: Do you want to get leads? Do you want people to attend your webinar? Do you want people to visit your store? Figure out your goal before building your campaign. Your business goal helps you choose which type of campaign will most likely get you the right results. If you choose a page likes campaign, don’t expect to get webinar subscribers. A video view campaign isn’t ideal for getting purchases on your website. Instead, create your ad based on the goal of the campaign. Most people come to Azriel and say they want Facebook likes. However, someone who likes your page won’t necessarily see your posts. When Azriel asks people why they want those likes, they say it’s because they want more views of their videos or more people on their email list. So Azriel suggests focusing on leads, sales, and brand awareness instead. Most clients want those three goals. Find your best potential audiences: Look for different ways to target the same people. For instance, say you aim to target people who work in marketing and base your targeting on the books or magazines they read or specific entrepreneurs they like. You might target people who like Seth Godin and people who are interested in Tim Ferriss because those audiences are probably similar. When you simultaneously run different ad sets that target different groups, you can see which of your audiences gets the best results. Azriel emphasizes that when you run these ads, you aren’t targeting fans of the page. You’re targeting people with an interest in that topic. That distinction is very important when you set up your audience. For example, 20 million people might like a famous person’s page, but 200 million people might be interested in that person. To determine whom to target, you can use the Audience Insights tool in Facebook Ads Manager. Use Audience Insights to learn whom to target with your ads. If you already have followers, purchasers, or email subscribers, Audience Insights can tell you about your followers’ demographics, pages they like, and interests. Audience Insights even shows how often your followers use Facebook, where they use it (mobile or desktop), and how often they click ads. Then you can look for people similar to your current followers. Audience Insights gives you a list of different pages to look at, such as celebrities they follow, news stations they watch, political figures they care about, and magazines they read. By breaking down this information, Audience Insights gives you basic information for targeting similar audiences. The Facebook Audiences tool, also in Ads Manager, allows you to create an audience from a file of customer data. 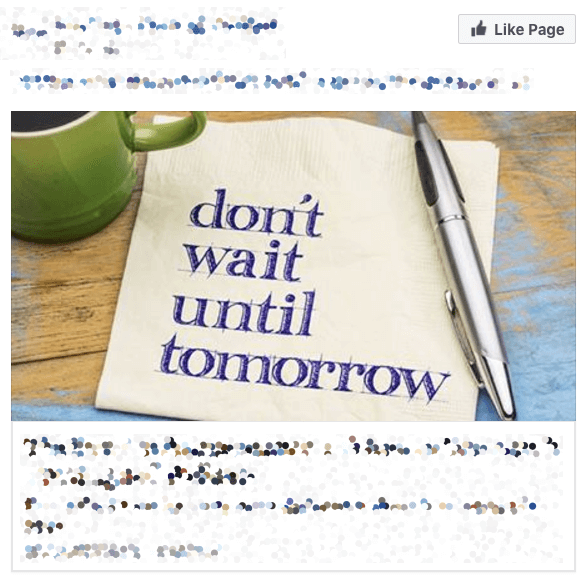 If your file has at least 400 or 500 people, Facebook will match those customers to Facebook users and share basic details about those customers in Audience Insights. 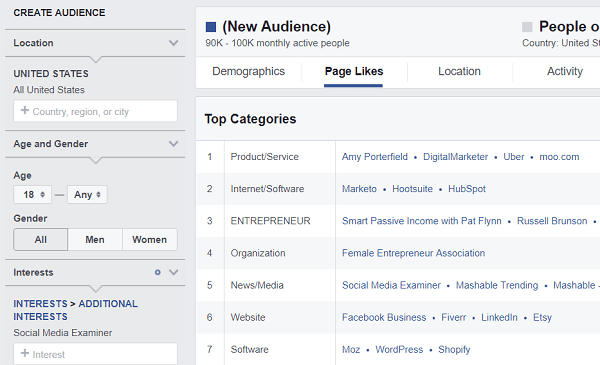 If your list has at least 1,000 people, Facebook will show you all of the insights about that audience. In Ads Manager, go to Audiences and upload your file. (The upload process will take 30-45 minutes.) Then when you go to Audience Insights, you can select that audience and see details about it. To begin finding your best audiences, Azriel recommends comparing different audiences. Many times, your website visitors will be similar to your email subscribers, who will be similar to your purchasers. For instance, you may start seeing that their ages are about the same, they’re all married or single, they’re all male or female. When you start discovering patterns, you can build your own audiences. You can also compare audiences based on interests. For example, type in Social Media Examiner, and Audience Insights will tell you about the people with that interest. Then compare that audience to your existing audiences. Audience Insights also enables you to see the interests of fans of other pages. Engage audience segments with the best possible ads: Most businesses create only three ads for every ad set. In doing so, these businesses miss huge opportunities because several factors influence how the Facebook algorithm and your audience perceive your ad. These factors include the image or video, the text, and the landing page. For example, ad text can appear in three places: the post text above the image, the big bold headline, and the description. Each month, Facebook users see hundreds of thousands of posts. Those who like a certain topic (say, bicycles) will click whenever they see the word bicycles. However, one group of people clicks when they see the word in a headline, another clicks when it’s in a description, and a third group clicks when the topic appears in the post text. If you create only one version of the ad and put the word bicycles only in the post text, you could potentially miss out on the best ad you ever made. To help find the best ads, Azriel creates several versions of an ad, altering where the text appears and the image that appears in each version. For each ad, create a variation that displays each line of text in every possible location. Specifically, for one ad, Azriel creates three lines of text (A, B, C), where A is the post text, B is the headline, and C is the description. Then in Power Editor, he duplicates the post and switches two of the placements (for example A, C, B). He continues in this way until he’s created every text placement combination, which is six different versions. Each ad in the set has the same text but the text placement is different. Next, Azriel tests four different visuals with the six versions of text. This brings the ad set up to 24 different ads. He’ll also do another version of the text (lines D, E, F), and put those six variations with the four images. When he’s done, the ad set contains 48 ads that include two versions of text (ABC and DEF) and four images. I ask how Azriel knows what text to write. Azriel recommends thinking about what will get someone to click or watch a video. You want enough text to give value, but not so much that your audience doesn’t want to click. Also, make sure you don’t say the exact same thing three different ways. For the visual, Azriel recommends using video instead of still images because he’s noticed that cost per impression on images has increased compared to videos. Azriel created a 10-second video that featured four still images and free music from Facebook and reduced the cost per lead by about $0.15. So if you have the ability to use a video in ads, even if it’s just a basic slideshow, do it. Also, when you choose images (or video), think about why people care about your product and use images that convey what’s important to your audience. The visual can be anything, as long as it looks nice and conveys your message. You can even use stock images. Choose images (or video) that convey what’s important to your audience. 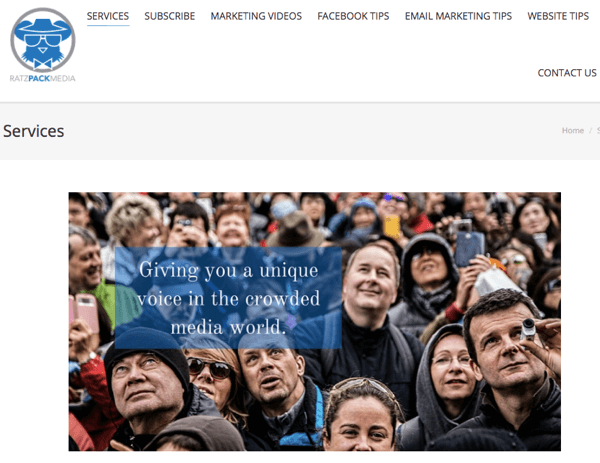 For example, when choosing images for Social Media Marketing World, Azriel suggests looking at why people come to the event. Is it because they have a great time? Is it because they network? Is it because of the speakers? If you know that people attend to see three particular speakers, use images of those speakers in the ads. If people are coming to have a great time, use pictures of people having a great time. Listen to the show to hear my idea for testing ads with still images versus video. Set up different ad sets in your campaign, one for each audience you want to test. For example, if you want to reach entrepreneurs, you might have three different audiences based on interests in a magazine, an author, and an influencer. If you’re remarketing, you might have several different remarketing audiences. Whomever you’re trying to reach, you’re targeting the same types of people but talking to them differently. After your ads run for at least 36 hours, you can begin to optimize the ads. To do this, watch the metrics that tell you when something is wrong with an ad. These four key metrics are CPM (cost per 1,000 impressions), CPC (cost per click), time on site, and the conversion rate on the landing page. The first two metrics appear in Ads Manager, and the latter two appear in your website analytics. Each metric can tell you where a change is needed so the ad can perform better. CPM: As all your ad sets run simultaneously, CPM tells you how well your audience and ads are working together. If some ads have a low CPM and others a high CPM, the ads are fine; the people you’re talking to are the problem. If the CPM is high for all of your ad sets (for instance, for each ad set, you’re paying $28 for 1,000 impressions), then the audience isn’t a problem; the ads need to be fixed. CPM tells you when the ads are right but the audience is wrong. CPM tells you when the ads are right but the audience is wrong, the audience is right but the ads are wrong, or they’re both wrong. If you have five audiences, and $28 is on the high end, a lower CPM might be $5, $1, or even $0.53. CPC: The next metric to look at is the cost per click. If your CPM is down, you’re targeting the right people and they should want to click on your ad. However, a high CPC shows people aren’t actually clicking on your ad, which means the text or call to action isn’t strong enough. If your CPC is high, be more aggressive in your ad. Tell people to click to get certain information or change the call-to-action button. Azriel almost always uses the Learn More button, because his tests show that the other buttons cost more. You can also put “Click here to download your ebook” as one of the three lines. Although it might seem like cost per click is based on the number of people who click, Azriel says cost per click actually depends on how well Facebook thinks your audience and ad work together. If Facebook feels the audience and the ad match, the cost per click should go down. If Facebook believes your ads have no correlation to the people you’re reaching, then Facebook will charge you a lot of money. I ask if narrowing the audiences will reduce the CPC, and Azriel says yes and no. Going too narrow is a problem because a target audience of 17 people will be very expensive. However, for an audience between 150,000 and 250,000, spending $10 or $15 a day in that ad set is a great result. Time on site: Time on site is calculated with Google Analytics and UTM codes. 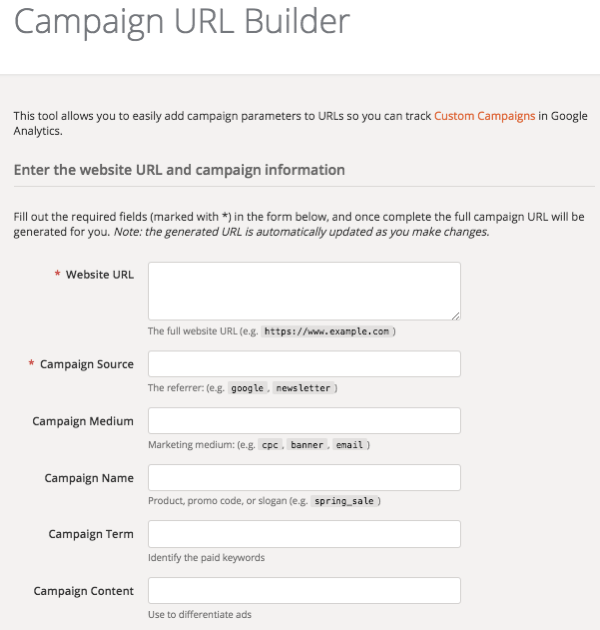 Use Google URL Builder to add UTM codes to your URLs. You need to know whether the people who visit your page stay on your page. When you get a lot of traffic (which happens a lot when people target the Audience Network), the cost per click is usually low (a few cents). However, if Google Analytics shows that people spent an average of 12 seconds on your site, you’re not going to be happy. You want a balance between paying for the click and visitors staying on your site. Visitors might leave your site quickly for a few reasons. Check whether the landing page delivers on the promise in the ad. If your ad promises a Facebook ebook but the landing page has a Google Analytics ebook, that person will leave. Check whether the landing page doesn’t work very well. For example, are mobile users leaving because the page isn’t mobile-friendly? Visitors will also leave if they don’t like the content. For example, if the imagery is wrong or they don’t like your video, they have no reason to stay. When you analyze time on site, it helps to know how much time someone should spend on the landing page. For example, if you want people to watch a two-minute video, then two minutes on site is good. When people don’t spend enough time, it’s a clear indication to fix your page. Watch conversion rates to judge the effectiveness of your ads. 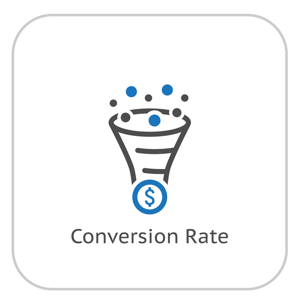 Conversion rate: People saw your ad, clicked on it, and read the content on your landing page but for some reason aren’t converting. Azriel believes people don’t convert for two reasons: They don’t care about the offer or the form asks for things they don’t want to give. One of Azriel’s clients was asking for a phone number on their form, and no one wanted to give it. However, changing their request from a phone number to an email worked much better. The client just needed to test those two things. If someone spends five minutes looking at a product page but doesn’t buy, they might be interested in that type of product, but not the specific product they viewed. The solution? Test other products or give a better deal on that product. This approach applies to anything. I ask how often marketers need to check these metrics and optimize their ads. Azriel says to look at the overall campaign 36-48 hours after you begin running the ads. Analyze the ads on the ad set level after 5-7 days, and analyze at the ad level after 7-10 days. After you optimize your ads to achieve the best ads for the lowest cost, check your ads every day to make sure the metrics remain where you want them to be. Listen to the show to hear Azriel explain why he ignores an ad’s relevance score. For example, for a Facebook post, I wanted to add an emoji of a person making a muscle on their arm. When I searched for muscles, Emojipedia showed an emoji called Flexed Biceps. I clicked the emoji and then copied and pasted it directly into my Facebook post. Listen to the show to learn more and let us know how Emojipedia works for you. Learn more about Azriel on RatzPackMedia.com. Follow Ratz Pack Media on Facebook and check out the Messenger bot for more on Azriel’s Facebook ads process. Read the Facebook Pixel eBook. Check out the Facebook Ads Mastery online course. Take a look at Audience Insights. Keep an eye on your Google Analytics. Learn more about Facebook’s Audience Network. What do you think? What are your thoughts on Facebook advertising? Please leave your comments below.